The Dangling McCAIN Puppet aka "SONGBIRD"
Recording of John Mccain while a prisoner of war. Authentic recording found.An audio recording has surfaced proving that U.S. Senator John McCain collaborated with the North Vietnamese by recording a “Tokyo Rose”-style propaganda message that was broadcast on North Vietnamese radio in 1969. 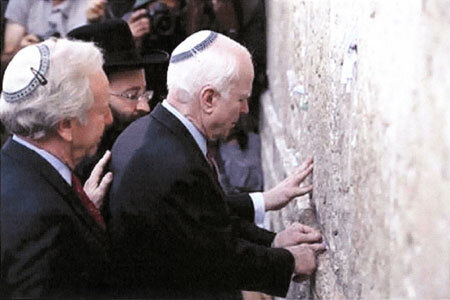 Jewish Senator Joe Lieberman and McCain at Jerusalem's "Wailing Wall"
your fullest support of Israel’s agenda. to McCains’ ill-fated, ill-advised presidential run of 2008.
explosion in the engine” after making a safe ejection. engine.” So, the Admiral’s son benefitted from the fix again. aircraft after being hit by a surface to air missile over Hanoi. John McCain lies in a hospital bed in Hanoi, North Vietnam, after being taken prisoner of war. were schools, orphanages, hospitals, temples, and churches. criminal who had bombed a school. admission is only the tip of the iceberg of his traitorous behavior. broken pelvis, broken arm and ruptured spleen. to without contesting that was finalized on April 2nd, 1980.
worthless junk bonds after Lincoln Savings and Loan collapsed. investigating Keating and became known as the Keating Five. during House Banking Comm. hearing on failure of his Lincoln Savings & Loan Assoc. seven years later and after much watering down ... of course. pushed very hard for an Iraq invasion. International Republican Institute (IRI) since 1993.
foreword for the Popular Mechanics 9/11 disinformation book. 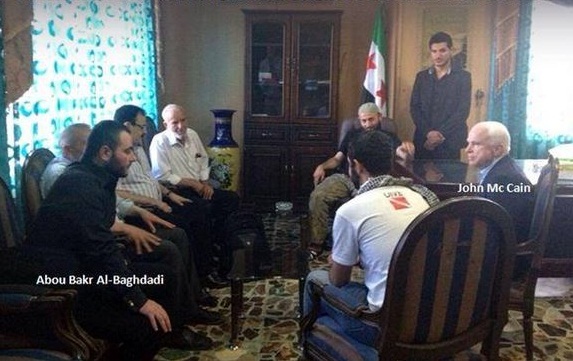 McCain chatting with ISIS leaders aka "Syrian Oposition"
John McCain totally disgusts me. Anyone of these POWs is worth 1 million John McCains. I don't even know any of these possible POWs or MIAs. But I can tell you that it has always haunted me because I am absolutely positive that they left many many POWs behind. My heart weeps for their families and for those who were left behind. I ask everyone to please forward this email to as many as you possibly can to take down John McCain and let him wallow in shame. Please, please read this entire accounting. McCain’s antics on board the USS Forestal in 1967.
record as a prisoner of war in North Vietnam. from the tail of the aircraft. F-4 pilot was reportedly killed in the conflagration. down over North Vietnam on October 26, 1967. His support for pro-Israel, anti-Russian American foreign policy was zealous, verging on fanatical. This explains part of that puzzle. This is a reprint of an article from August 2008 by the excellent Michael Collins Piper. Vladimir Putin once famously speculated that he thought McCain suffered from mental instability caused by his long detention in Vietnamese prisons, when trying to explain why McCain was so fanatically pro-Israel and hostile towards Russia. Perhaps Putin's vaunted intelligence resources hadn't filled him in on McCain's family ties. (10) John McCain Praises Father’s Whitewashing of Israel’s Attack on the USS LIBERTY! Independent presidential candidate Ralph Nader today called on Senator John McCain to come clean on what he knows about the 1967 attack on the USS Liberty. The attack killed 34 American soldiers and wounded more than 170. The Israelis claim that the attack on the Liberty was an accident. But the crew of the Liberty, and high ranking U.S. officials, including then-CIA director Richard Helms, then-Secretary of State Dean Rusk, as well as Admiral Thomas Hinman Moorer, former Chief of Naval Operations and Chairman of the Joint Chiefs of Staff — said the attack was deliberate. Senator McCain’s father, John S. McCain Jr., at the time Commander in Chief, United States Naval Forces, Europe, rushed approval of an internal report exonerating Israel. A few years ago, a Florida bankruptcy court judge, A. Jay Cristol, wrote a book — The Liberty Incident — accepting the Israeli thesis that the attack was an accident. "After years of research for this book, Judge A. Jay Cristol has reached a similar conclusion to one my father reached in his June 18, 1967 endorsement of the findings of the court of inquiry. I commend Judge Cristol for his thoroughness and fairness, and I commend this work." 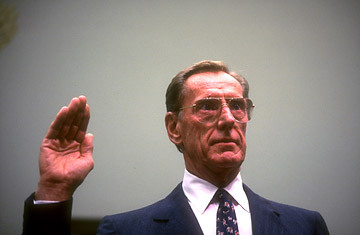 In a signed affidavit released at a 2003 Capitol Hill news conference, retired Captain Ward Boston, a former Navy attorney who helped lead the military investigation into the 1967 Israeli attack on the Liberty, said that former President Lyndon Johnson and his defense secretary, Robert McNamara, ordered that the inquiry conclude the incident was an accident. Boston said Johnson and McNamara told those heading the Navy’s inquiry to "conclude that the attack was a case of ‘mistaken identity’ despite overwhelming evidence to the contrary." 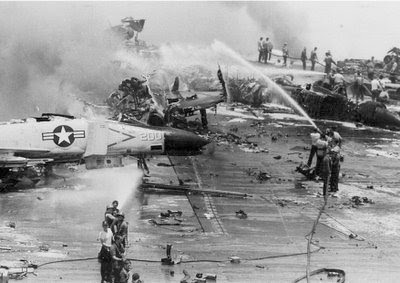 According to press reports, Boston was senior legal counsel to the Navy’s original 1967 review of the attack. Boston said in the sworn statement that he stayed silent for years because he’s a military man, and "when orders come … I follow them." Boston said he felt compelled to "share the truth" following the publication Cristol’s book — which concluded the attack was unintentional. "The evidence is overwhelming that the Israeli attack on the USS Liberty was not an accident," Nader said. "I call on Senator McCain to search his conscience and tell the truth about what he knows about the cover up of this Israeli attack that killed 34 American sailors and wounded 170 other American sailors on that clearly identified U.S. Navy technical research ship." “Today’s press conference in Helsinki was one of the most disgraceful performances by an American president in memory. The damage inflicted by President Trump’s naivete, egotism, false equivalence, and sympathy for autocrats is difficult to calculate. But it is clear that the summit in Helsinki was a tragic mistake. “Coming close on the heels of President Trump’s bombastic and erratic conduct towards our closest friends and allies in Brussels and Britain, today’s press conference marks a recent low point in the history of the American presidency. That the president was attended in Helsinki by a team of competent and patriotic advisers makes his blunders and capitulations all the more painful and inexplicable. As the Sunday news programs made their final edits on what would be a weekend of nonstop tributes, we couldn’t help but reflect on this man’s tireless and treacherous record of warmaking – death and destruction visited upon people all over the world because of his dedicated public service to the industry of war. Here’s but a sampling of what we and others had to say about his legacy. The Guardian describes the late John McCain as a "war hero". 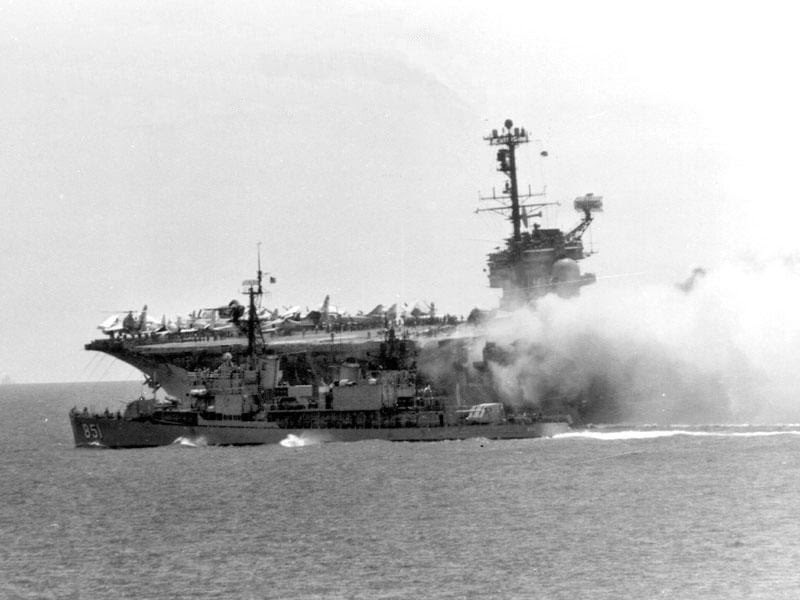 As a pilot in Vietnam, McCain cravenly bombed a mostly undefended country of civilians. When he was skilfully brought down, his life was saved by the very people he was trying to harm. A true American plastic hero. Sad news for all Ukrainian people - died a great friend of Ukraine Senator John McCain. We will never forget his invaluable contribution to the development of democracy and freedom in Ukraine and the support of our state. Condolences to the family and all American people. Sputnik: The news of Mr. McCain’s death has drawn mixed emotions across the international public. Why was his figure so divisive? Patrick Henningsen: John McCain is a very divisive political character, so [he] made a lot of enemies over the years in politics. And he was quite assertive and he put himself really out front on a lot of controversial issues, and I think that probably one of the one of the most controversial aspects of John McCain, what he stood for, really was pushing for military intervention and the application of hard power by the United States in overseas war theaters, and actively lobbying to arm what he called “the moderate rebels” in Syria which we now know were a strain of al-Qaeda-affiliated terrorist groups. He actively lobbied for TOW missiles and MANPADs to be sent to them in order to turn the tide of that war, when in effect what it did was extend the war in Syria, and has succeeded in flooding the region with illicit arms and weapons that has caused untold suffering. So I can understand why there are a lot of people who would oppose his militaristic stances on Syria, Libya, Yemen and also on Ukraine. And his career in Vietnam as well, if you want to add that, there’s no shortage of people lining up to oppose what he stood for. Sputnik: I remember in recent times, one of the incidents that first brought Mr. McCain to my attention was when he was in Kiev, Ukraine at the time and actively encouraging the public to go against the democratically voted-in parliament; that was 2014, of course when the uprising and the new Western-oriented government came in. Would you say then that Mr. McCain was very much part of the deep state, the American geopolitical culture that so embedded the country in recent years? Patrick Henningsen: Yeah, I think that if anybody embodies the deep state or embodies the unofficial forces that really conduct power in Washington along the lines of the Pentagon, the Central Intelligence Agency and the Department of Defense in general, it is John McCain; he embodies that unseen sort of hidden hand. The problem with John McCain is that, I think, sneaking into Syria and being photographed with militants, being on stage with Svoboda and Right Sector lobbying for lethal aid to the Ukraine and aligning himself with neo-Nazi factions there prior to the Maidan coup, he’s going to attract a lot of warranted criticism, unfortunately. But because he represented the deep state interests, he was absolutely ring-fenced and protected by the mainstream media in the United States. 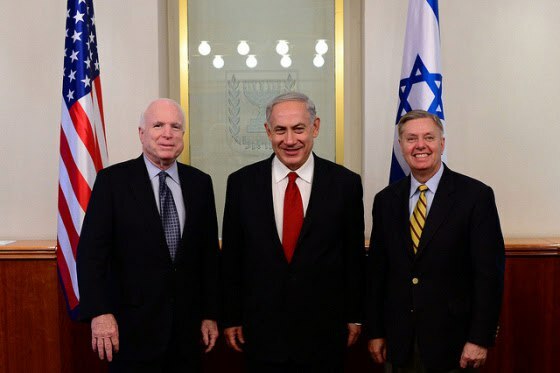 Hawkish Republican Senators Lindsey Graham and John McCain are complete operatives of the US Deep State, which wants to keep wars going in the Middle East, says E. Michael Jones, a political analyst in Indiana. Jones, a writer, former professor, media commentator and the current editor of the Culture Wars magazine, made the remarks in a phone interview with Press TV on Tuesday. Graham on Sunday warned President Donald Trump against pulling American forces from Syria, saying it would lead to a re-emergence of the Daesh (ISIL) terrorist group and increased Iranian influence over the Syrian government. "It’d be the single worst decision the president could make," Graham, a Republican member of the Senate Armed Services Committee, said in an interview with Fox News. "We got ISIL (Daesh) on the ropes. You want to let 'em off the ropes, remove American soldiers," Graham said. PROOF THAT JOHN “INSANE” MCCAIN HELPED CREATE ISIS: It is not simply Democrats who are mounting a coup against President Donald Trump! John McCain is essentially the political spokesman for the surveillance state that is leaking and faking information to discredit or entrap Trump, the deep state who have set the world on fire with “regime change.” It was an open “secret” that our government armed and created ISIS even before the John Kerry tapes surfaced. Yet McCain continues to meet with ISIS and Al Qaeda terrorists, sneaking across the border to meet with them at the end of February. McCain’s policy of creating & aiding ISIS for regime change is NOT Trump’s policy of destroying ISIS. Why is his secret meeting not aiding & abetting terrorists and seditious conspiracy? There are Two Main reasons why Senator John McCain wants to keep the attack on the USS Liberty buried. 1- McCain’s Father (Admiral John S McCain) was in charge of US Naval Forces in Europe at the time of the attack and Admiral McCain was involved in the COVER-UP, of the attack on the Liberty. THE UNZ REVIEW — Although the memory has faded in recent years, during much of the second half of the twentieth century the name “Tokyo Rose” ranked very high in our popular consciousness, probably second only to “Benedict Arnold” as a byword for American treachery during wartime. The story of Iva Ikuko Toguri, the young Japanese-American woman who spent her wartime years broadcasting popular music laced with enemy propaganda to our suffering troops in the Pacific Theater was well known to everyone, and her trial for treason after the war, which stripped her of her citizenship and sentenced her to a long prison term, made the national headlines.